Observing your silly theatrics, people have come to a conclusion that your party is all set to lose, says TRS working president. 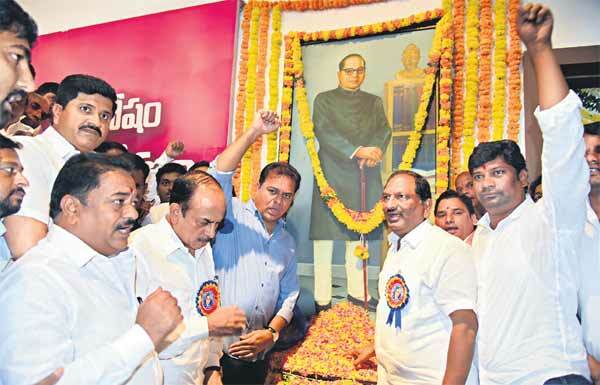 TRS working president KT Rama Rao, Home Minister Mohd Mahmood Ali and others paying tribute to a portrait of Dr BR Ambedkar on his 128th birth anniversary, at TRS Bhavan in Hyderabad on Sunday. Hyderabad: TRS working president KT Rama Rao on Sunday found the allegations levelled by Andhra Pradesh Chief Minister N Chandrababu Naidu against the Election Commission of India (ECI) with regards to Electronic Voting Machines (EVMs) as absurd and silly. He pointed out that while Naidu had no problem with EVMs when he won in 2014, he is finding fault with them in 2019 after realising that he was faced with defeat. In an informal interaction with media persons on Sunday, Rama Rao, wondering how Naidu’s allegations of the EVMs were tampered with can be believed, sought to know how Congress won in the Assembly elections in three States. He advised Naidu to accept people’s verdict with all humility and stop blaming others for his failures/defeat. “Observing your silly theatrics and blame game, people have come to the conclusion that you are frustrated as your party is all set to lose power in Andhra Pradesh on May 23,” he added. The TRS working president also ridiculed the objections of Naidu over ECI transferring AP Chief Secretary, DGP and other officials. He pointed out that during the 2009 elections, ECI replaced the then DGP SSP Yadav with another IPS officer AK Mohanty, but the then Chief Minister Y S Rajashekhar Reddy did not object and returned to power. “Officials cannot influence the election outcome if a leader enjoys people’s support,” he affirmed. He strongly condemned Naidu terming Chief Minister K Chandrashekhar Rao and YSRCP president YS Jagan Mohan Reddy as pets of Modi. He pointed out that it was Naidu who spent four years with Modi and one could have called him Modi’s pet then. “Even we could have called you the same as it was you who spent four years with Modi. But both Chandrashekhar Rao and Jagan Mohan Reddy maintained utmost decency and dignity,” he added. Telangana Rashtra Samiti (TRS) working president KT Rama Rao on Sunday condemned the destruction of a statue of Dr BR Ambedkar at Punjagutta after it was removed by Greater Hyderabad Municipal Corporation officials as its installation did not receive the requisite permissions from GHMC. On behalf of TRS, he requested the State Government to probe the incident and initiate stringent action against those who were responsible. Meanwhile, Opposition parties flayed the government with Congress and BJP describing the incident as an insult to Ambedkar’s memory. The Congress party on Sunday continued its attack on the State government over the destruction of the statue with Telangana Pradesh Congress Committee president N Uttam Kumar Reddy saying the incident reflected the respect the TRS government had for the man who gave India its Constitution. Speaking after garlanding the Ambedkar statue near the Tank Bund along with other Congress leaders on the occasion of Ambedkar’s 128th birth anniversary, Uttam Kumar Reddy said it was unfortunate that an Ambedkar statue was “broken up into pieces and thrown into a garbage dump yard in the city.” He demanded stringent action against those involved in the incident. He also wanted to know what happened to the Telangana government’s promise of erecting a 125-foot tall Ambedkar statue to mark the 125th birth anniversary. “A team was sent to China and Japan on a study tour for the statue project. Where is the statue?” he asked. At another press meet, BJP State president Dr K Laxman demanded an apology from Chief Minister K Chandrashekar Rao to the people for what was done to Ambedkar’s statue in Panjagutta. Laxman said that the Chief Minister should take stern action against GHMC officials for demolishing the statue. He also wanted to know just how many of the statues erected in the city have been done so with proper permissions from the civic body. TRS working president KT Rama Rao has emphasised the need for electoral reforms where every citizen of India automatically becomes eligible to cast his or her vote when he or she turns 18. He suggested reforms in the functioning of the Election Commission of India (ECI) and wanted a nation-wide debate in this regard. During an informal interaction on Sunday, the TRS working president reacted to complaints over missing and duplicate votes during the recent Lok Sabha elections and questioned how a person who voted in Assembly elections did not find his or her name in the electoral rolls and becomes ineligible to vote in parliamentary elections in less than three months. “ECI must answer to the people over missing and duplicate votes especially after the Aadhaar seeding,” he asserted. He wanted political parties to take initiative and encourage voters to enrol their names and exercise their voting rights. “Political parties must introspect why they are unable to inspire people to come out and vote,” he said. Rama Rao, however, felt that it was improper to blame the State or the Central governments for irregularities in voters’ enrollment list. He pointed out that neither governments have any say in the affairs of the Election Commission of India which operates a parallel system without the involvement of any State or Central government functionary. The TRS working president said there was nothing objectionable over the increase in poll percentage. “Only the approximate poll percentages are announced on the day of polling as they are based on the preliminary assessment. The exact poll percentage can be calculated only the next day after the consolidation of poll percentages across all polling stations,” he said, adding that this procedure was being followed for decades now and doubting the ECI for minor variations in poll percentage is not right. Rama Rao said elections were held in a peaceful manner in Telangana State and all stakeholders including voters and political parties behaved with utmost discipline. He felt that it was one of the finest examples of good and transparent governance. “Otherwise, people have seen how elections led to physical attacks and even murders in our neighbouring State,” he said.